I love the way that the cards I pull each usually come up in matching colors. This time it’s The Hermit, and the reversed Six of Pentacles, from the Yoga Tarot. 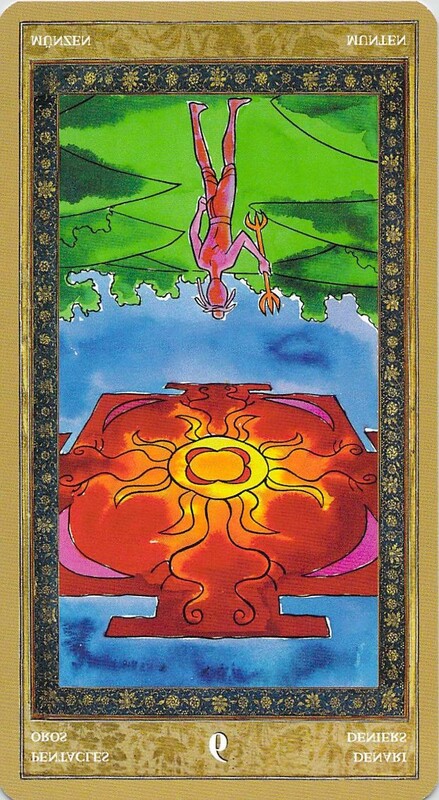 The Yoga Tarot’s Six of Pentacles card, when it is reversed, seems like depression to me, mainly because the mandala in the sky has a sun on it — so in this particular deck, the Six of Pentacles reversed feels like the Sun (happiness) reversed. As if our feelings of security and belonging (like the first chakra red on the mandala) have fallen out of the sky. What do depressed people almost always want to do? Be left alone — and spend time alone, like the Hermit. And most non-depressed people think that’s a bad idea. They feel it’s better to get out! See people! Have fun! Actually, the body and spirit do know how to heal themselves. The instinct to spend time alone is wise. It’s not a negative byproduct of depression, but rather a positive one, assuming the time alone is used wisely. Spending time alone, staring into space, looking at a wall (or whatever) — that starts to sound like meditation to me. It may or may not be Zen-style counting your breaths meditation. That’s okay. It may be a more contemplative meditation. Though this impulse to be alone and sit and stare may look like letting go of life, it is not. It’s body and spirit ganging up on mind and saying, look, mind, you need to take some time here. This is a healthy development. It can, of course, turn into an unhealthy development. The depressed mind can go around in thought circles, obsessing in a negative way. Still, I have faith in spirit’s ability to take over. If those thought circles spiral around long enough, I think they will settle. I do. (The settling process can be hastened with more formal meditation, though!) Once those thoughts settle, we can find ourselves in a different place. Not necessarily any happier. Maybe still quite depressed. But in a different place. We may find our own presence. We may find that the world can swirl around us without touching us or disturbing us even when we are out in it, in the midst of chaos — and that can be a pretty mind-blowing place to find, if you are used to being a sensitive person who gets overstimulated by chaos. Notice also, looking at these cards, that we see the green of the heart chakra swirling around the Hermit and seemingly taking over. Spending time WITH the color green, by the way, can be very healing for the heart chakra and for depression in general — if the Hermit’s time alone can be in a green place, that would be good, even if you are stuck in a cubicle with a computer and the only green you see is from a nature screensaver. Notice also, in these cards, that the Hermit has emblazoned on his chest the Yoga Tarot’s symbol for swords, a trident. Swords, in tarot, often represent thoughts and ideas — the world of the mind. Meditation is about taming the mind and its thoughts. 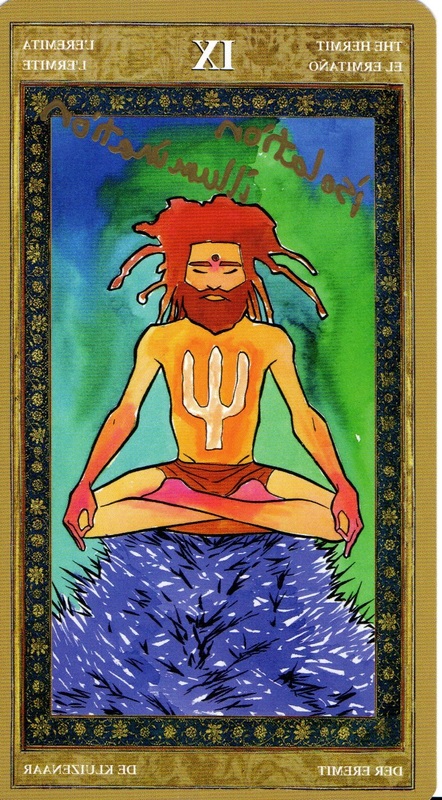 The yogi on the Six of Pentacles card is holding a trident as well. Not everything about depression is bad. Depression can be the stimulus that pulls us down a more meditative, contemplative, spiritual path. Previous Here We Go Again: Mercury Rx and a Bumpy Ride. So: Meditate! I’m Bonnie, not Norman (? ), but thank you! I am Norman Bonnie, I was just introducing myself and paying compliment to your post. Oh, of course, lol. This is why I should drink a cup of coffee before replying to posts… 🙂 Thanks. Very wise and insightful, Bonnie.